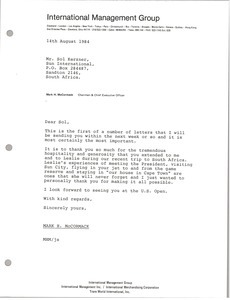 South Africa - The first of a number of letters to Solomon Kerzner, McCormack thanks Kerzner for his hospitality to him and Leslie during their recent visit. 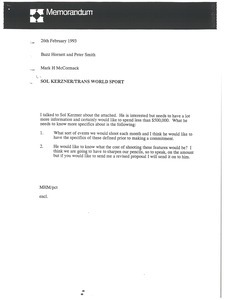 South Africa - McCormack thanks Kerzner for a most pleasant holiday. 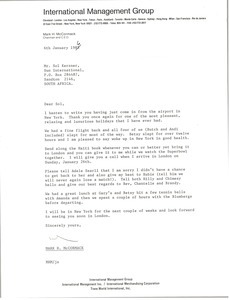 South Africa - January 14 letter to Sol Kerzner in South Africa proposes additional exposure for Sun City/Lost City by including them in weekly Trans World Sport international program. Trans World Sport Distribution Report is attached. February memo to Hornett and Smith instructs them to produce specifics like type of events to shoot and what the costs of shooting would be. 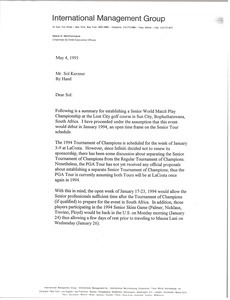 South Africa - Concerning the attached summary for establishing a Senior World Match Play Championship at the Lost City golf course in Sun City, Bophuthatswana, South Africa, which would debut in January 1994. 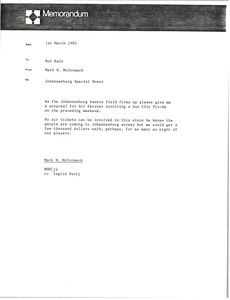 South Africa - Details the 1994 World's Strongest Man Competition, its transmission and rights, and invites Kerzner to consider using Sun City/Lost City for the venue. Would like to discuss further. Attached are internal faxes discussing the plans.